KEEGUARD PREMIUM is a free standing edge protection system especially designed for roofs with limited space such as where solar panels have been installed. The system is suitable for both permanent and temporary applications on roofs. KEEGUARD PREMIUM can be used in combination with standard KEEGUARD edge protection for applications where the counterbalance will not fit in with the existing roof equipment. 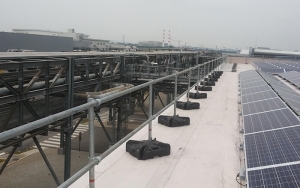 KEEGUARD PREMIUM is a collective fall protection system which overcomes the trip hazards associated with traditional free standing cantilevered systems by eliminating the need for off-set counterweights. 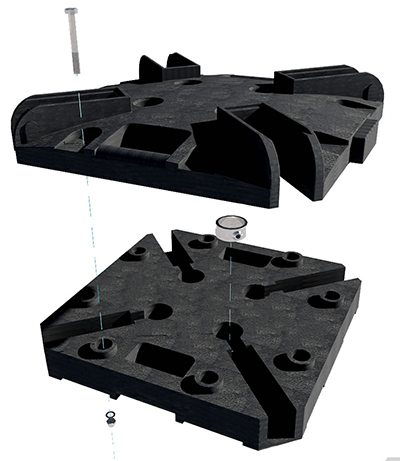 The system features unique two part interlocking recycled base weights. These weights can be split to allow a single person to carry the weight or be carried complete by two people using the moulded handles. KEEGUARD PREMIUM has been tested to EN 13374: Temporary Edge Protection Systems - Product Specification Test Methods and has been awarded a Class A Pass. KEEGUARD PREMIUM is quick and easy to assemble. Pre-built 1100mm high uprights feature open cup fittings for quick and easy assembly. The uprights are secured into the recycled PVC base weights by galvanised steel collars and set screws which allow variable angle changes of direction. The system allows bay sizes between uprights of up to 3m with 2.2m returns at each end on open ended systems. All railings and uprights are hot dip galvanised to EN ISO 1461 to provide long term resistance to corrosion.